Rosacea is a common pink/red rash of the skin which usually occurs on the central part of the face (nose, cheeks, chin and forehead). The cause of Rosacea is not fully understood but many believe that the blood vessels in the skin (of the face) dilate too easily. It is more common in women, those who are fair skin and those who flush easily. Rosacea starts with extreme redness when blushing but can lead to the redness turning into a darker shade and staying there all the time. This can then be combined with pus spots and paples (small red bumps) and the appearance of telangiectasia (small dilated blood vessels). The nose can also grow big, red and bulbous. This is due to an overgrowth of sebaceous glands. The face can also swell with this condition. The best time to catch Rosacea is when it’s in the early stages, however treatments can take place when Rosacea is in the later stages. In the later stages of rosacea a course of treatments is recommended for best results. Combining the chemical peels and Thermavein treatment together is in our opinion the most effective way to eliminate Rosacea. A chemical peel is a controlled trauma to the skin resulting in newly regenerated skin cells leaving a smooth, younger, blemish free, even toned looking skin. The peels used for rosacea are gentler for sensitive skin types which are prone to thread veins, redness and inflammation. The peel moisturises the epidermis, improves skins firmness and elasticity, soothes irritation and reduces redness of the skin. ThermaVein is specifically designed to remove thread veins which quite often occur with rosacea. The permanent removal of these thread veins combined with Medik8 chemical peels and aftercare is extremely effective and quite possibly the most productive solution. Our objective is to simply provide the most effective solutions for various skin conditions and complaints including the most challenging. We match the best of what current technology and industry advancements have to offer with highly experienced consultants to deliver the best service we can. 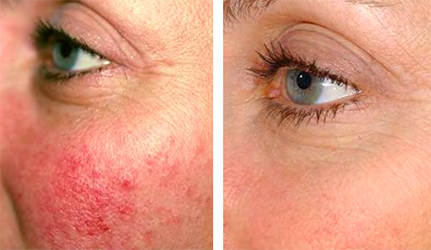 The combination of these two treatments make us incredibly effective at treating Rosacea. If we cannot reduce your redness by 50% in the first month we will refund any money you have spent with us.